I don’t know how this all-rounder slipped under my radar, but from now on, I’ll be keeping a very close eye on her. Just in case you’re baffled, I’m talking about COCO PERI. 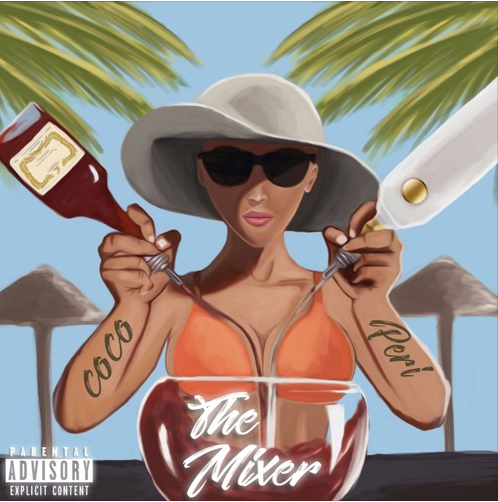 Maybe I’m giving the game away too early in this review, but her latest mixtape ‘The Mixer’ made me sit up and raise my eyebrows with approval. The ten track production seamlessly weave between the atmospheric arrangements of R&B hip-hop/rap and dancehall, topped off with the occasional show of the tropical-esque overtones. This north Londoner had no trouble switching it up from her a rich jazzy vocal to a smooth flow that just melts into the dreamy soundscapes. ‘The Mixer’ serves as a great outro for the summer – and is well worth a place in your valuable record collection….hit the play button on this bad boy mixer!